Get Married on New Year's Eve!! 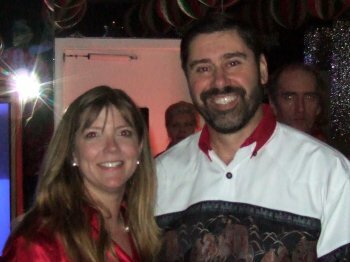 Sherilyn and John met at SSQQ. Sherilyn will kill me for adding this anecdote but it is too funny to let ride. One night in early 2005 Sherilyn was on her way home when she decided to drop in on a Tuesday night Salsa practice to see if anyone was there that she knew. As usual, the floor was full of terrific Salsa dancers mixing it up with their usual energy. Sherilyn started to tap her foot to the beat. She was dying to dance. Then her heart dropped to the floor. Oh no! The only "white boy" (her words) in the whole place was walking over towards her. She just KNEW that he had to be the worst dancer in the room and here he was making a path right to her. Sure enough, he asked her to dance. She reluctantly accepted his offer, but only because "someone good hadn't gotten there first!". Then to her complete shock her future husband turned out to be a terrific Salsa dancer! That's how Sherilyn met John Edwards. 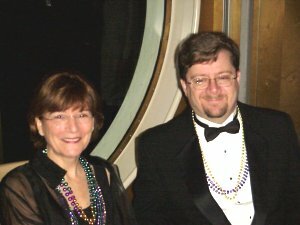 When John and Sherilyn came on the SSQQ Alaska "Love Boat" cruise (5 weddings and engagements on that trip! ), they had only been dating for a few months. They had such a marvelous time together on the trip, they moved up their timetable and got engaged just three months later in October. 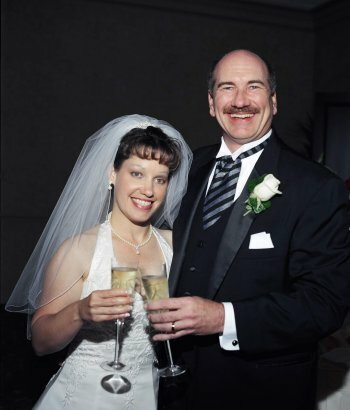 Then just five months after the July 2005 cruise, John and Sherilyn got married on New Years Eve 2005/2006!! 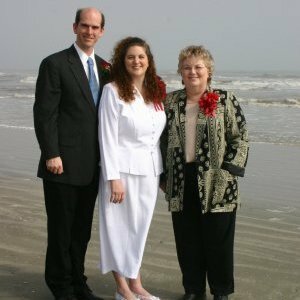 Sally David and Jeff Gray Get Married!! 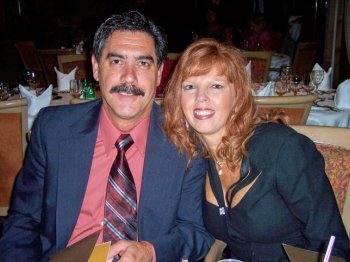 On February 17, 2006, Marla Archer introduced herself to Heidi Matthews and her fianc� Kenny. Heidi and Kenny were at the studio for a private "Slow Dance" lesson for their upcoming wedding. Heidi smiled at Marla. She said she had been referred to the studio by Jeff Gray, one of her co-workers. "By the way, Marla, did you know that Jeff recently married Sally David?" 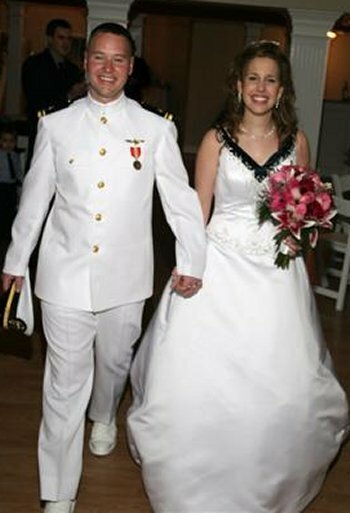 Wow... Sally and Jeff's wedding makes the FIFTH wedding and engagement to come out of the July 2005 SSQQ Love Boat Cruise to Alaska! 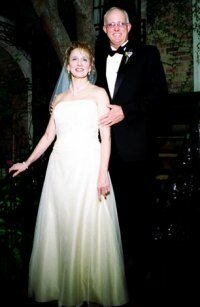 Linda Malin and Bill Holden - Got married in October 2005 (see below). 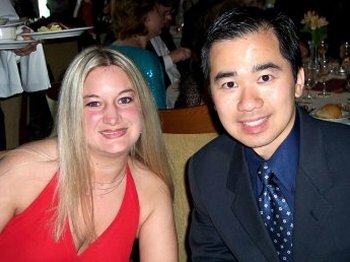 Kevin Lee and Michelle Spiris - announced their engagement on the Alaska Cruise. 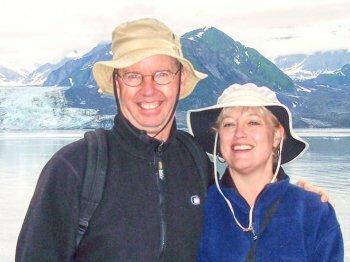 Three other couples on the trip, Bill and Barbara Moore and Chuck and Brenda Morton previously met at SSQQ. 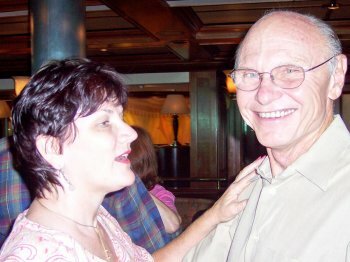 Risa Pippin and George Keiller - met through Scottish Dancing, but took classes at SSQQ throughout their courtship which makes them an 'honorary SSQQ couple'. Oh, I forgot Marla and myself. Make that four other couples! And two other couples "connected" on this trip. They are still an "item" seven months later. Eleven couples all on one trip: 8 SSQQ Marriages, 1 SSQQ Engagement, and 2 SSQQ Relationships . Do you think there something to this SSQQ "Love Boat" stuff or am I just making it up? You decide. Congratulations Jeff and Sally! You make a great couple! 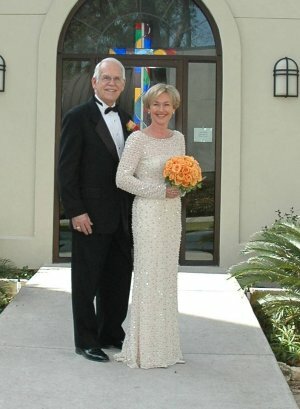 Shirley Grossestreuer and Tim Caldwell get Married! I ran into my friend Shirley at the Wild West Tuesday night. As you requested, I told her you had heard a rumor she had gotten married. Sure enough, your sources were correct. Shirley says she is very happy to Mrs Tim Cardwell! They met at SSQQ and got married this past November. Aubrey Smith and Billye Kridner get Married! Do you see any similarity in the pictures above?? The eerie comparison is no accident. This lovely couple planned their first dance in great detail. They are the perfect answer to the question: "What does the First Dance at a wedding look like when two people who already know how to dance get married?" The answer is: "They look awesome!" From what I gather, the large crowd thought they were watching professional dancers in action. Many people come up to tell Aubrey and Billye that was the finest display of dancing they had ever personally witnessed in their lives. The response was very touching. So what's the background story? 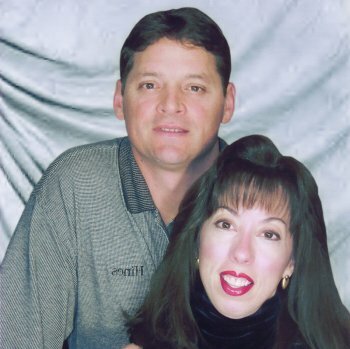 Aubrey Smith and Billye Kridner had been taking lessons here at SSQQ for several years dating back to 2002. They met here at SSQQ in one of the classes. They went together for a couple of years before they became engaged. 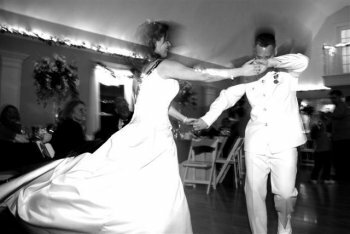 When Aubrey and Billye decided to get married in August 2005, they agreed they wanted to dance as if it were a scene from a fairy tale wedding. After all, they had already been practicing just for the fun of it for a long time. So they took some private lessons for more polish, practiced whenever they could, and concentrated on showing the world what it is like to see two people in love dance together. Then they hired a live band and had their reception in a Hotel Ballroom. For extra flourish, Aubrey brought his parents and family all the way from South Africa to see them get married and dance! I was honored to be asked to help them prepare for their first dance. The truth be told, I contributed a few moves and made some suggestions on leads, but Aubrey and Billye had already done their homework - they were wonderful dancers! One look at the gorgeous dress, the handsome groom, and the beautiful bride with her wonderful smile illustrate clearly they succeeded beyond the shadow of a doubt. Indeed the smiles on their faces tell the whole story... "Could I Have this Dance for the Rest of my Life..."
I have one more favor� would you spare a couple moments to tell me more about your wedding? 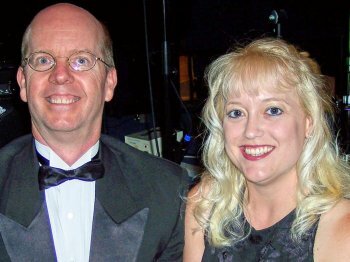 We met in Steve Gabino�s Beginning Swing class in June 2003. We started dating sometime during the whip classes later that year. 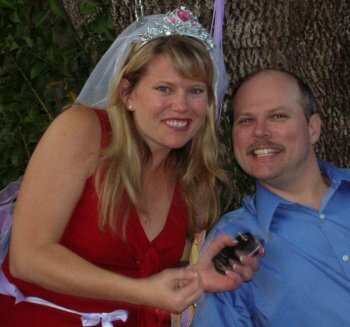 We were engaged on November 23, 2004. 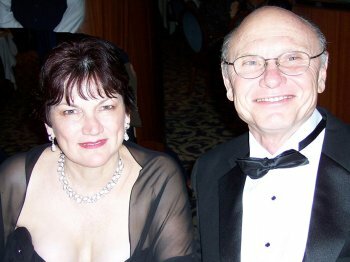 We were married on December 3rd at the Emerson Unitarian Universalist church and the reception was at the Courtyard on St James. We honeymooned in the Cape Winelands in South Africa. Did you two consciously decide to put energy into your first dance? Half an hour every day for the three weeks before the wedding. What song did you dance to? I love you more today than yesterday (but only half as much as tomorrow) by Spiral Staircase. What did the people say when they saw you? We received too many compliments to list. Did Billye have trouble dancing in that gorgeous dress? 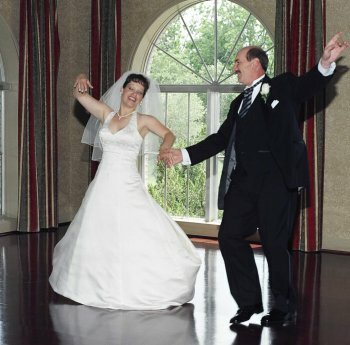 What dances did you dance at your wedding? 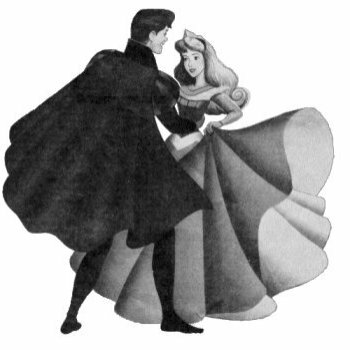 We danced a Foxtrot for our First Song, then, as you can see from the pictures, during the Reception we danced Swing, Foxtrot, Waltz, and Whip. Any suggestions for other couples getting ready for the first dance? 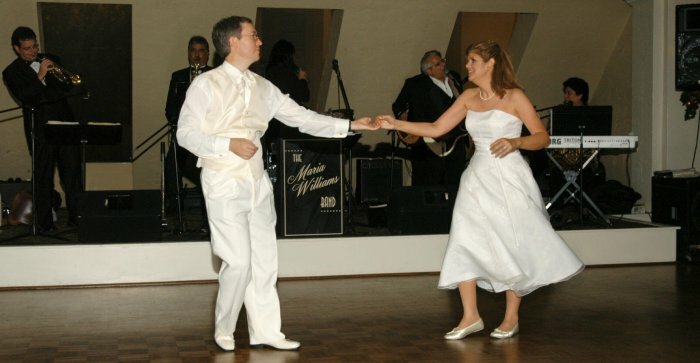 If you are planning to dance in a fancy outfit, do some practices with a similar outfit so that you get used to the way it moves when you dance. Spring for the band because live music really makes a big difference. Take lots of lessons at SSQQ! By the way, Aubrey, judging from Billye's smiles, you get my supreme compliment for a job well done! I am so proud of you! Let me change that, I am so proud of both of you! By the way, I have one last stupid question: Marla asked me to ask you how Billye�s dress got shorter in the last Whip picture. It must be a girl thing because I would have never noticed LOL! I had two dresses. The floor length I wore at the church and through the first set of dance music at the reception. There was one swing tune in that set and the petticoat was quite heavy and seamed to have a life of it own in a spin. I was glad I had planned for a change. I wore the tea-length to dance the rest of the reception. 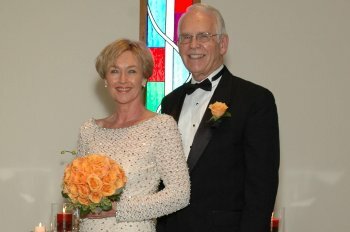 Allen McConnell and Angela Hennan get Married! 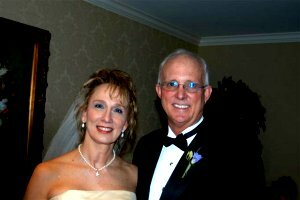 Linda Malin and Bill Holden get Married! 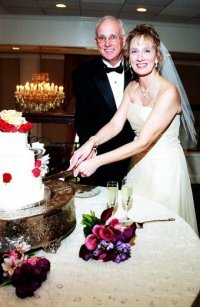 Clarence (CA) Riser and Cathy Bryant get Married! 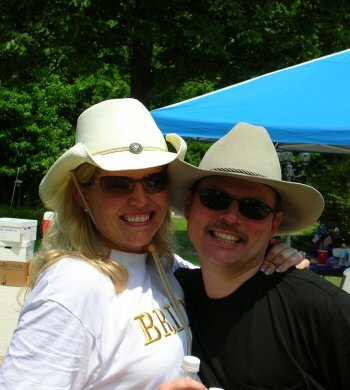 Sometime in August on the spur of the moment, long-time sweethearts Cathy Bryant and CA Riser decided to tie the knot. CA and Cathy are very well-known here at SSQQ. They have been studio regulars for four years. They have taken over 30 classes together from 2001 to present, been to numerous Halloween parties, and have taken 4 SSQQ cruises as well. Both CA and Cathy are medical professionals. However I don't believe they met through their profession. It is my understanding that they met right here at the studio. Although I am notorious for telling a tall tale here and there, I am embarrassed to admit that Cathy and CA were involved in the only retraction I have ever published in the SSQQ Newsletter. 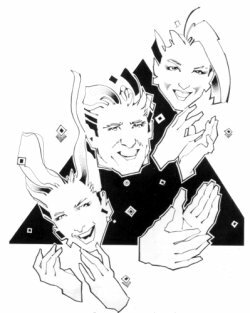 Back in 2003 I published a report that this couple had announced their engagement to be married. This Newsletter article was quite a surprise to Cathy and CA. Although I believe I have been forgiven since then, at the time they had a right to be more than slightly irritated with me. Even more embarrassing, I have never been able to figure out who told me they were engaged! I certainly never found an email to suggest where the rumor came from. It was just something that popped into my head one day as I was typing. And that is the complete truth. Thank goodness they are finally married. Now I don't have to apologize any more! James Bowling and Jennifer Klein get Married! 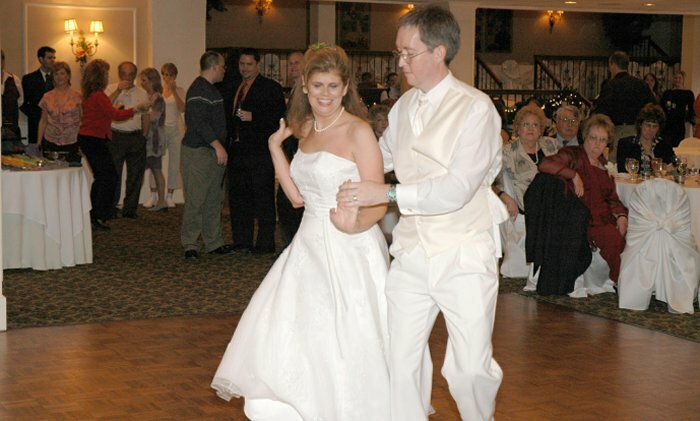 Although I am uncertain as to exactly how or when they met, I do know that dance brought James and Jennifer together. After a whirlwind romance, the bride and groom officially tied the knot pledging to share the marriage dance for the rest of their lives on May 26th. The happy couple both glowed as they each recited their vows during an intimate ceremony at the First Methodist Church followed by a dinner reception. The party continued as friends and family alike were invited to celebrate the couple�s marriage at an informal reception/cookout held at the Bowling family home in Huntsville, TX on Saturday, May 28th. James and Jennifer then took off for the South Pacific and a romantic honeymoon cruise visiting exotic ports such as Tahiti and Bora Bora. Everyone please join me in congratulating the happy couple! SSQQ Dance Instructors Melissa Gauthier and Randy Winfrey get Married! As you can see Melissa is a beautiful bride! I am very lucky to have met her. 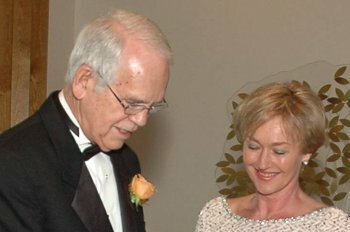 We were married at high noon on April 30, 2005 at the Sugar Creek Country Club, and there were several SSQQ members and instructors in attendance. The dance floor was crowded from the plethora of dancers. Thanks for making our meeting and subsequent marriage possible! I have had a lot going on the last month. 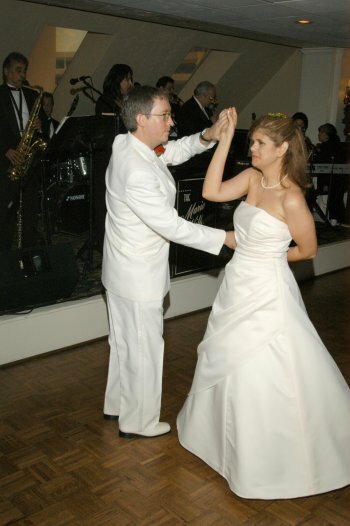 Shortly after Melissa and I got married, I had to get ready to dance in the Texas Classic. I won both Diamond Intermediate and Open Intermediate in the Male Pro-Am divisions! 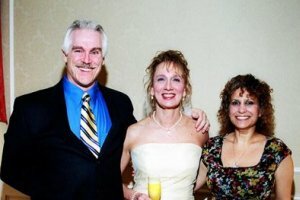 Former SSQQ Instructor Luci Howard and Darren Burns get Married! 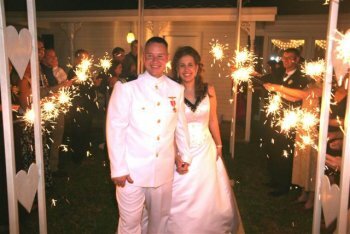 I thought you would like to know about another wedding resulting from a SSQQ cruise!!. 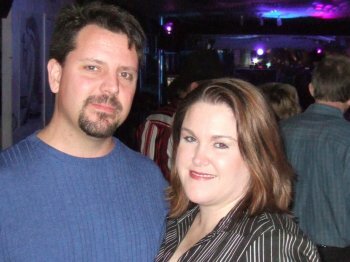 Luci and Darren first met on the SSQQ Rhapsody cruise in 2002. 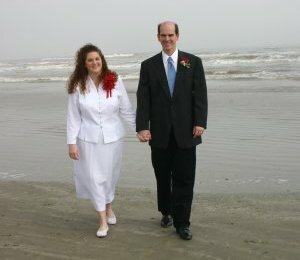 They were married on Valentine's Day 2005 in Galveston on the beach. Attached pictures are (1) Darren, Luci and Lauren Elizabeth Burns, (2) Darren, Luci and proud Mom Dolores Howard. Going on the cruise was my idea and it was a wonderful cruise and now look what awesome blessings we have received. 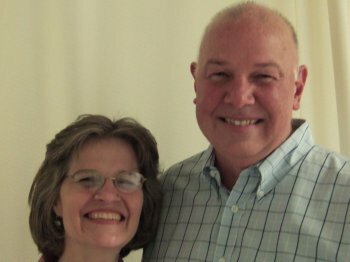 Bill Shaw and Sharon Crawford get Married! 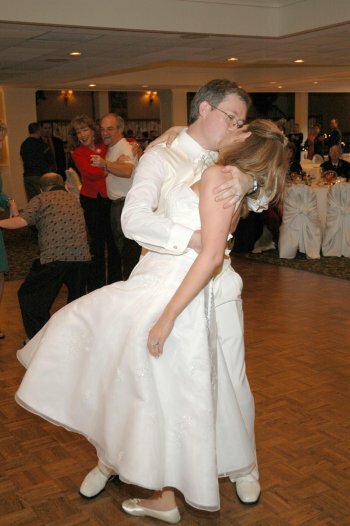 Note from Rick: One of the cruelest blows of 2005 came when I lost the story of Bill and Sharon's Wedding. Normally I write all my stories in "Word" on my computer and transfer the finished product to the web site. But I was so pressured for time that for this important story, I wrote it directly to the web site program. "Computers let you make more mistakes faster than any other invention in human history, with the possible exception of handguns and tequila. One month later in a simple but damaging blunder, I completely erased the bottom half of my Newsletter when I published the new material over it. It took only one key stroke of stupidity. I quickly discovered my mistake, but Sharon and Bill's story was permanently gone. My only hope is that perchance someone made a copy of the original story and they can help me resuscitate this important tale for two of my favorite people, Bill and Sharon Shaw. 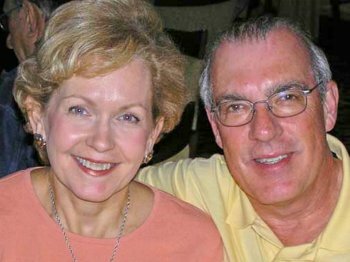 Cyndy Richardson and Mike Atchison get Married! Attached are a couple of pictures from the wedding. Cyndi's husband, Mike, is directly behind her in the picture of the two family's...and, of course, Britney her daughter and Brent, her new son. 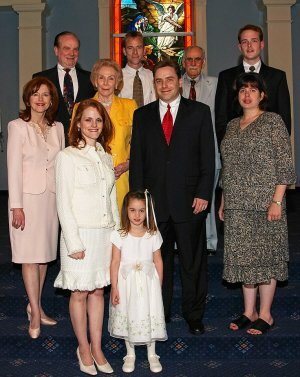 My Mother is in the yellow dress and my Father is in the light blue suit. 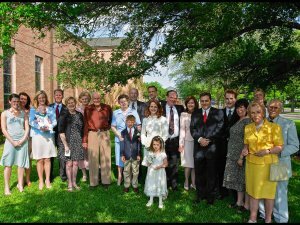 My two sons are standing right next to Betty in the two family picture with my nephew (wearing white shirt) at far back right side. 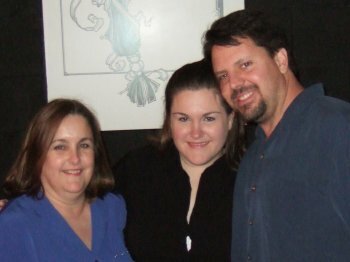 My son's (Chris's) wife (expecting a girl in July) is standing next to my Mother. My son Mike is wearing the bright red tie...he is our oldest. Chris is the youngest. 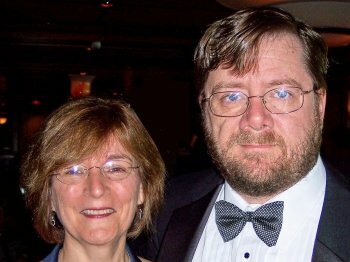 Philip Ritchie and Kathy Fink get Married! 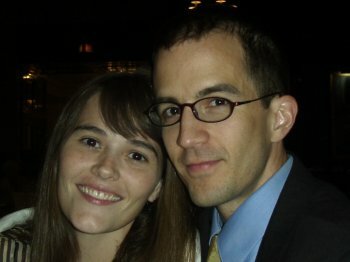 I sent you a note back in September letting you know that Phillip Ritchie and I were engaged and wanted to let you know that we were married on February 19, 2005 (3 years after we met in Beginning Two-Step). We had a beautiful outdoor ceremony at sunset in Tomball. The night was every bit as magical as I had hoped. One of the highlights of the reception was our swing dancing - I have no idea how we pulled it off with me wearing such a big, poofy dress, but we did! 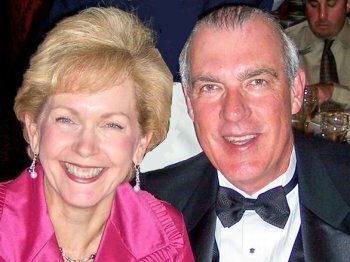 Joel McCleskey and Ruth Schauberger Get Married! 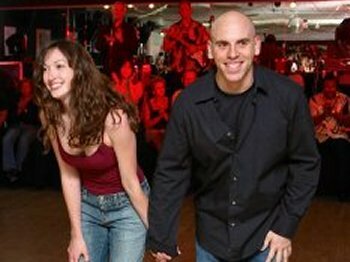 Joel McClesky, the amazing student of Anita Williams who has won every dance contest he has entered, married his beautiful girlfriend Ruth on January 29, 2005. 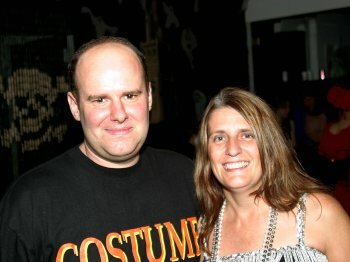 I hope Ruth didn't wear her Halloween costume to the wedding, but if she did, she would have looked great! Hopefully this handsome couple will share some stories and some pictures of the ceremony with us soon. Ray Conley and Darja Jarram get Married! Rick, thanks for your interest in my goings on! I met the lovely Darja ( it�s Czech and pronounced Daria) at a dance (where else?). 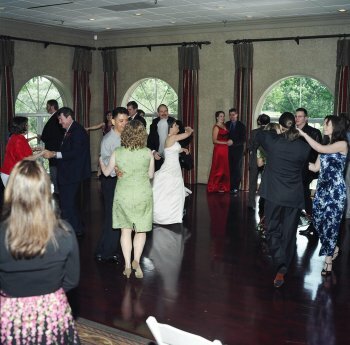 It was the TGIS dance at the Houston Racquet Club that I helped to get started in 1985, about the time I started taking lessons from you over at SSQQ. She just felt right dancing in my arms and I was hooked. We have been very busy crowding all our stuff into my small house in Larchmont, and we are looking forward to starting some more dance classes soon. Say hello to the mob, and guys, don�t give up. 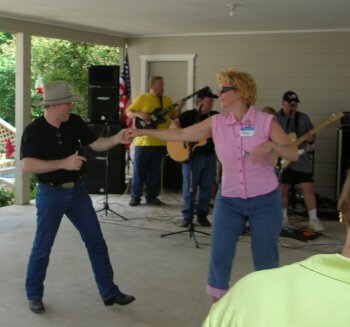 If you keep dancing, maybe you�ll get lucky like I did! Here are a few pics. By the way, I designed the chapel in the background, which was built by volunteers from the church. 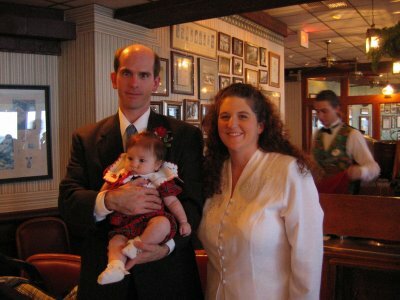 I didn�t have my own wedding in mind at the time but it sure came in handy.